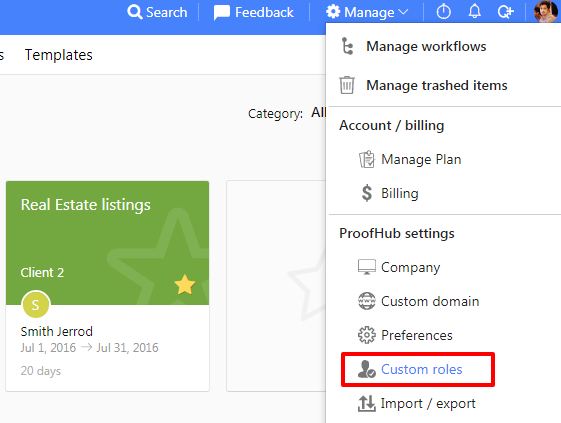 ProofHub enables you to customize the roles that you may want to assign to users added in your account. You can provide them different access levels for each section of ProofHub. 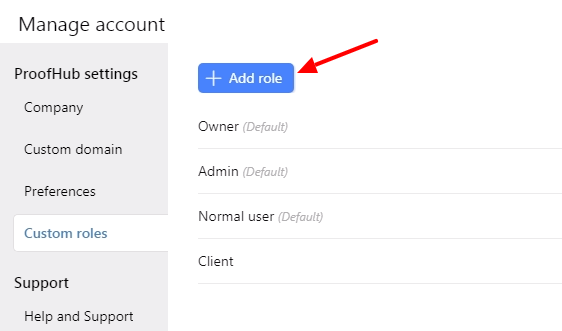 Click Manage account from the top bar and select Manage roles option. Click Add new role from left corner of your page. Give title and description to your role. Hit Save and your role will be saved. 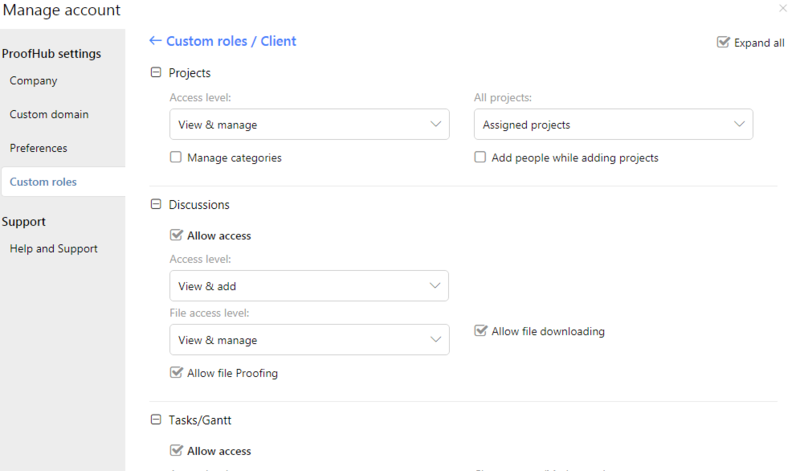 There are three types of access levels to customize a role in ProofHub. View only – With this option, one can only view things in their account but won’t be able to add, edit and manage them. View and add – With this option, one can view things in a section and also, add items in it but they won’t be able to edit any item. If you have selected the checkbox Allow to edit and delete self added data, which is present under the Others category, then the person will be able to edit and delete all the data that has been added by himself. View and manage – With this option, one can give users the access to view, add, edit or delete and manage items from their account. View only: A person who has been assigned this access level can only view the projects. He or she will NOT be able to add new projects, edit and delete projects, manage people and create a copy of the project. View and manage: With this option, a person can add new projects, edit and delete projects, manage people and can create the copy of the projects. Apart from these three access levels, you have the complete authority to revoke the access for a whole tab (Discussions, Tasks, Timesheets etc). For example, if you don’t want your clients to see Timesheet tab as a whole you can uncheck the Allow access option. This could be done for other tabs as well. Assigned projects: In this access level a person will only be able to see the projects that are assigned to him. If you want to grant any person the access of managing categories, you can select the checkbox Manage categories given in this section. View only: With this access level, a person can only view the discussion topics. He or she won’t be able to add or edit anything in it. View and Add: With this access level, a person can view discussion topics and can also add new topics. If you want to grant any person the access to edit and manage topics created by themselves, then you need to check the option Allow to edit and delete self added data present under other section. View and Manage: With this access level, a person can start a discussion, add comments, edit/delete or manage the discussion topic. View only: With this access level, a person can only view the tasks added under task-lists. He or she will NOT be able to add task, edit or delete, comment on a task and archive tasks. View and add: With this access level, a person can view the to-do lists and can add new to-do’s list. If you want to grant any person the access to edit and manage task-lists created by themselves, then you need to check the option Allow to edit and delete self added data present under other section. View and manage: With this access level, one can view a to-do list, add to-do list, assign tasks to people, edit and delete them. View only: With this access level, a person can only view the comments on the task. He cannot post, edit or delete a comment. View and add: With this access level, a person can only view comments of others and add his or her own comments. He or she can only edit his own comment if Allow to edit and delete self added data box is checked under the Others section. View and manage: In this access level a person can post new comments, edit and delete his own comments and other person’s comment too. All tasks: This access level allows a person to be able to complete all the tasks irrespective of the fact that to whom it has been assigned. Assigned tasks and tasks assigned to no one: With this access level, a person can complete the task assigned to him and also those tasks which has not been assigned to anyone. Assigned tasks: With this access level, a person can only complete the assigned tasks. If you want to grant any person to view All tasks tab under Everything section then select the checkbox View all tasks given in this section. Similarly, if you want to grant the access to view and manage task list visible in Gantt chart then select the checkbox View & manage Gantt given in this section. View only: With this access level, a person will only be able to view the items present in the calendar. He or she will neither be able to create milestones, events, tasks nor they will be able to edit and delete existing items from the calendar. View and add: With this access level, a person can view existing items as well as add tasks, milestones and events in a calendar. They will be able to edit their own data only if Allow to edit and delete self added data option is checked. View and manage: With this access level, a person can create, edit and delete milestones, events and tasks. All milestones: This access level allows a person to be able to complete the milestones irrespective of the fact that to whom it has been assigned. Assigned milestones and milestones assigned to no one: With this access level, a person can complete the milestones assigned to him or her and also those milestones which has not been assigned to anyone. Assigned milestones: With this access level, a person can only complete the assigned milestones. If you want to grant any person to view Calendars tab then select the checkbox View calendars given in this section. View only: With this access level, a person can only view the notes. He or she will NOT be able to create notebooks, notes, edit and delete notes and will NOT be able to post comments on the notes and manage the collaborators. View and add: With this access level, a person can create notebooks and can add notes to it. He can manage collaborators and can edit notes only if Allow to edit and delete self added data option is selected. View and manage: With this access level, a person can create notebooks, add notes, manage collaborators, edit and delete notes and can post comments on it. All notes: With this access level a person will be able to manage the content of all notes irrespective of the fact that who has added it. Self added notes: With this access level, a person will be able to edit and manage the content that has been added by himself. None: With this access level, a person will NOT be able to manage anybody’s content. He will only have read-only access of the content. View only: With this access level, a person can only view the files, He or she can also upload the files but they won’t be able to delete files, create a new folders and subfolders. View and manage: With this access level, a person can also upload files and create folders and subfolders. If you want to grant any person the access of downloading the file, then select the checkbox of Allow file downloading given in this section. If you want to allow a person to proof files, then you can select the checkbox Allow file proofing given in this section. View only: With this access level, a person will only be able to view the timesheets and can download them in CSV format. He or she will NOT be able to add new timesheet, record time in a timesheet, archive a timesheet. View and add: With this access level, a person can view a timesheet, add a timesheet and record time in a timesheet. If Allow to edit and delete self added data option has been checked then he can edit and delete timesheets created by him only. View and manage: With this access level a person can create, edit, delete and archive timesheets. If you want to allow a person to view all timesheets across all projects then select the checkbox View All Time in this section. 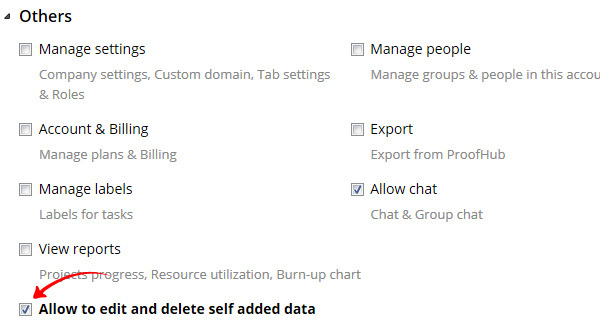 Chat: With this option, you can enable and disable chat for people. If you’ve given the users the access to all projects, then they will be able to chat with all people who are part of same/different projects. If you’ve restricted the users to only to assigned projects, then they will be able to chat only with the people who are added with them in their assigned projects. Others: This section allows one to grant access to the other settings of the application. Manage settings: You can select the checkbox of Manage settings if you want to provide access of ProofHub settings to any person from their account. Manage People: Similarly, you can use this option if you wish to give them access of managing people present in your account or to add new people to your account. Account & Billing: With this option, you can provide users access of making payments or see invoices from their account. Export: With this option, you can allow a person to export data from your ProofHub’s account. Manage labels: To allow a person to manage labels present in your ProofHub account you can use this option. Manage logs: With this option, you can give users access to manage activity logs from their account. Manage apps: With this option, you can give users access to manage third parties apps(install and uninstall). View report: To allow people to view reports, you can use this option. Allow to edit and delete self added data: This option is related to View and add access level. If you want to give a person the access to edit the data added by himself or herself, then you can select this option. 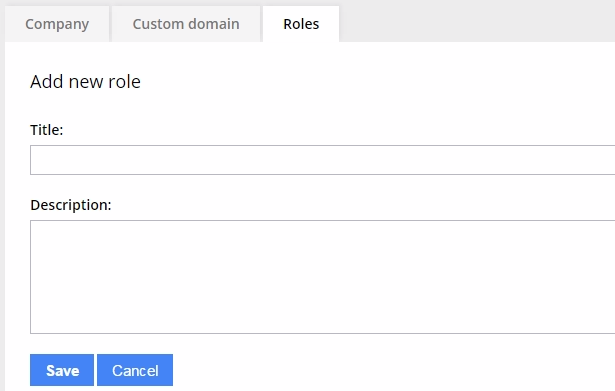 Hover on any of the new role created by you. Click the menu icon and choose Edit option. You can make the desired changes and Click Update to save the changes. To delete any role, choose Delete option from menu icon. Click Yes to confirm the deletion and select any new role that you would like to assign to the users assigned to existing role. Click Ok and your role will be deleted.